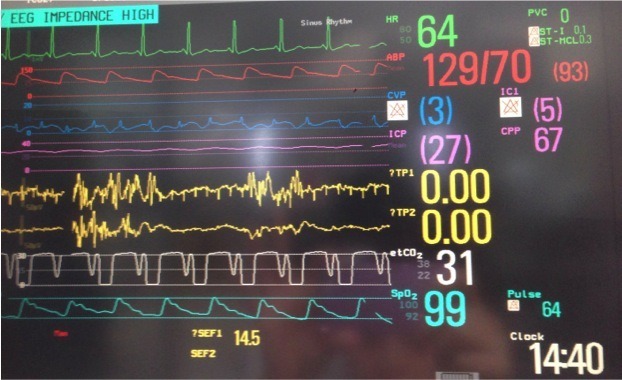 What does this monitor screen tell you about TBI? A patient is being treated in ICU for a severe traumatic brain injury. Q1. What are the findings? Q2. What is your interpretation of the ETCO2 measurement and morphology of the ETCO2 trace? The ETCO2 is 31 mmHg. ETCO2 is typically up to 5mmHg lower than PaCO2, as some alveolar dead space is always present. This means that the patient’s PaCO2 is likely to be at the lower end of the optimal target range of 35-40mmHg used in management of severe TBI. The ‘curare cleft’ in the ETCO2 trace suggests that the patient is receiving neuromuscular blockade, but is incompletely paralysed resulting in spontaneous breathing. The cleft towards the end of the ETCO2 plateau phase is usually due to diaphragmatic movement as neuromuscular blockade weakens. A similar appearance can be caused by movements during operative procedures or even partial disconnection at the mainstream CO2 transducer. Q3. What is your interpretation of the other findings on the monitor? The patient has severe TBI with raised intracranial pressure (ICP). The ICP trace is flattened and rounded. Rounded peaks are seen with elevated ICP, though a flattened trace may indicate transducer compression. The CPP is >60 mmHg, in accordance with Brain Trauma Foundation (BTF) guidelines. A MAP of 93 mmHg is required to achieve this given the high ICP (CPP = MAP – ICP). The patient likely requires a noradrenaline infusion to maintain this, especially as he would be requiring heavy sedation. The presence of continuous EEG (cEEG) monitoring, with some evidence of burst suppression, is consistent with the patient receiving thiopentone for refractory elevated ICP. cEEG in this setting might also be used to detect occult seizure activity as a cause of persistently raised ICP. Other sedatives can also cause burst suppression, but cEEG is not usually used for this purpose unless barbiturates are being used for refractory elevated ICP. Q4. What is the significance of ‘burst suppression’ in this case ? Burst suppression on cEEG monitoring is used as a clinical endpoint when barbiturates such as thiopentone are used to treat refractory ICP. A target burst-to-suppression ratio of 1:10 is typically used (i.e 10 seconds of suppression for every second of burst activity). Q5. Describe the use of thiopentone for the treatment of refractory elevated ICP due to severe TBI. High dose barbiturates, such as thiopentone, are a third tier option in the management of severe TBI to control refractory elevated ICP. They are usually considered after osmotherapy when the only other remaining non-surgical option is therapeutic hypothermia. The evidence base is weak. Roberts I. Barbiturates for acute traumatic brain injury. Cochrane Database Syst Rev. 2000;(2):CD000033. Review. Update in: Cochrane Database Syst Rev. 2012;12:CD000033. PubMed PMID: 10796689.